I love baking and keep experimenting new recipes. But, the main constraint is my baking experiments is that I do not use eggs. Now, that is a vital ingredient in baking. So, I am always in the search of eggless recipes and sometimes try my own ideas to create some. One of the basic recipes of making an egg less sponge cake is using sweetened condensed milk (Hopefully, I will post it sometimes in near future). In India, it is a very common recipe in every vegetarian household. 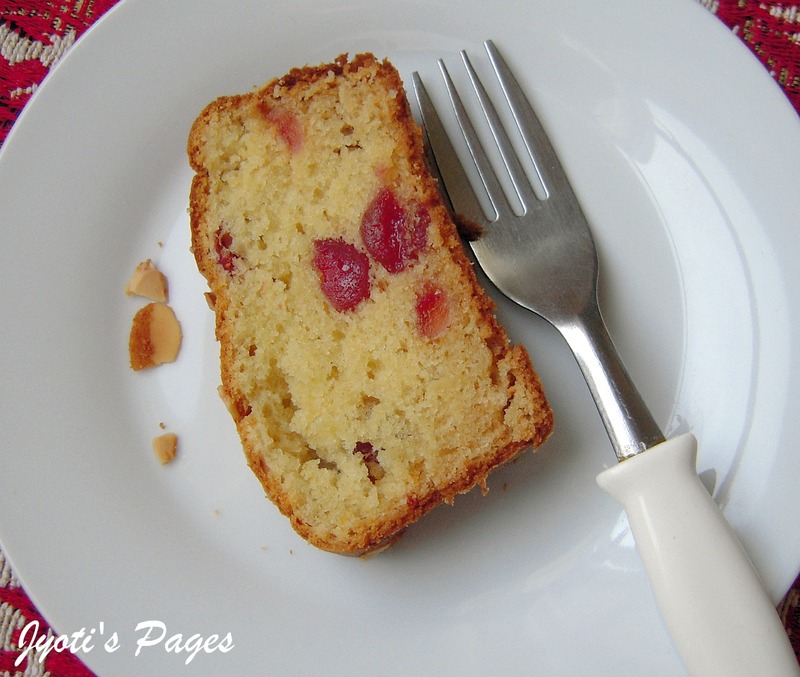 I have tweaked that recipe to come with this Egg less Almond and Cherry Cake. 1/4 cup ground almond powder. 1/2 cup + 2 tbsp condensed milk. 2 tbsp flaked almonds for garnishing. 1. Grease a 1 lb loaf tin or an 8" rouns cake tin and flour it. 2. Shift flour, almond powder, baking powder and baking soda 2-3 times so that the mixture is uniform. 3. Wash the glace cherries and wash off any syrup sticking to it. Pat them dry. 4. In a separate large bowl cream the butter and condensed milk, till it is well mixed and the mixture is light and creamy. 5. Add the dry mixture to the creamed butter and condensed milk mixture, mixing all the time. Add the milk little by little to get a dropping consistency batter. 6. Fold in the washed and dried glace cherries and spoon the mixture into the prepared tin. 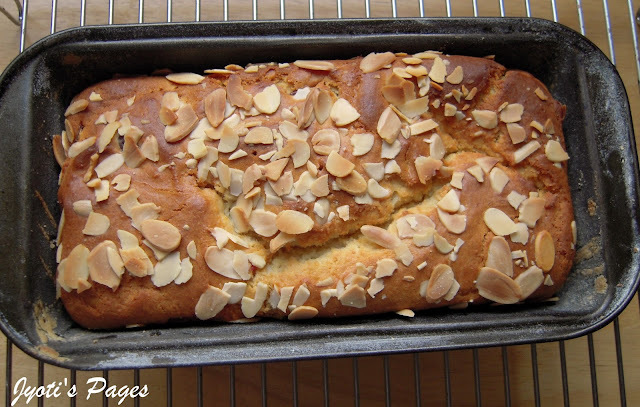 Sprinkle the flaked almonds over it. 7. Bake it at 180 C for 25 minutes and then lower the tempreture to 165 C and bake for another for 10 minutes, till the top is light golden and a skewer inserted in the middle comes out clean. 8. Cool it in the tin before taking it out on a wire rack. Cool completly on a wire rack before slicing. 1. If you do not have almond powder, try using equal amount almond puree ( almonds, soaked, blanched and pureed). Beat it into the creamed condensed milk and butter and proceed. 2. 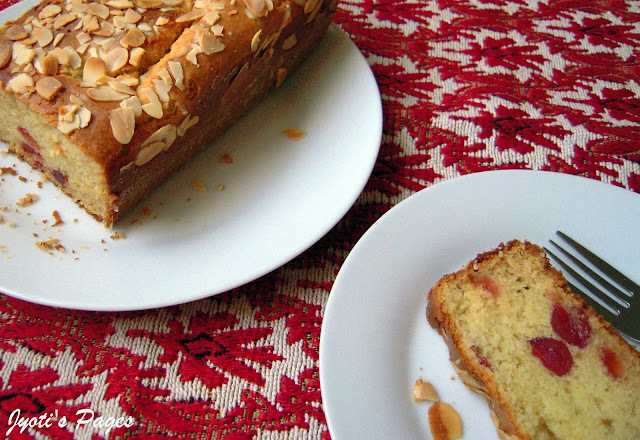 The almond flavour in this cake is mild, for a stronger flavour try adding 1/2 tsp almond extract (not essence as it has a very fake flavour). Linking it to Champa's Bake Off. Hey, I couldn't recognize that it is your blog. Was there a reason to start a different one? Thanks for the entry. That looks splendid! 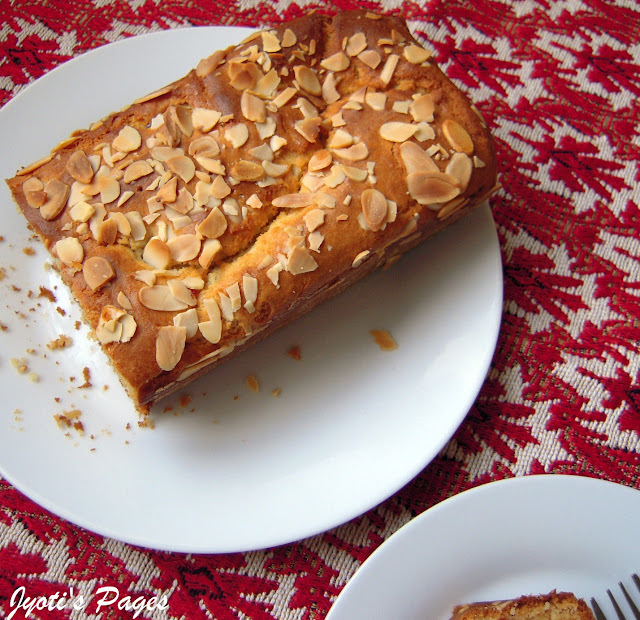 What a beautiful loaf..
yumy moist cake.. do you visit Madhuram's blog? All her stuff is eggless. Pretty amazing! Thanks for the helpful tips on substitutes. Yummy and delicious cake. Love it. hey jyoti, baked this yummy cake yesterday, it came out great!!!!! So Moist and fluffy and the baking time was perfect my dear. I actually halved the recipe and tried. Thanks for sharing this!!!! yummy cake.. Just loved it..
Hi Jyoti, In your recipe you advise to 'fold in the wahed' - what is 'wahed' ? Hi Jyoti, In your recipe, you advise to 'fold in the wahed' - what is 'wahed' ?